Fall is in full swing. Our heat is turned on, and the comfort food eating is in full force–without the gluten and dairy, though! You absolutely don’t need them. Do yourself a favor and pick up Against All Grain by Danielle Walker. She has a fantastic New England Clam Chowder that’s dairy and gluten free. It’s amazing. Melt oil in a large pot over medium heat. Stir in leeks and onions, and cook until the onion softens and turns translucent, about 5 minutes. Add sweet potato, squash, carrots, apple, and chicken stock. Bring to a boil, then reduce heat to medium-low, cover, and simmer until the vegetables are soft, about 20 minutes. 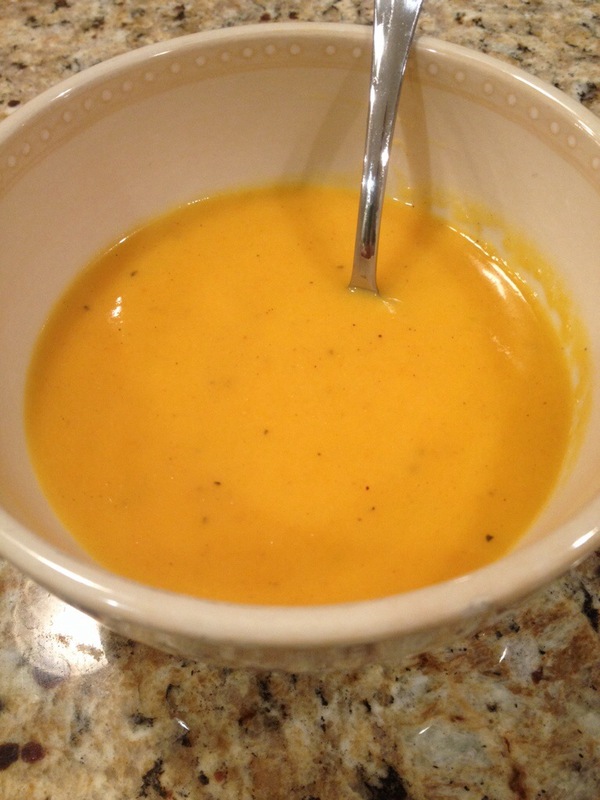 Carefully puree the soup in batches in a blender, or use a stick blender to puree the soup right in the pot. Once the soup has been pureed, return it to the pot and stir in cider and coconut cream. Season with nutmeg, salt, and pepper; simmer gently for 5 minutes. Serve hot with Elanas Pantry’s almond flour biscuits.